The client, Jolly Jacks Jumping Castles only recently moved into the jumping castle and party hire home business, and was seeking to build a website to both dynamically inform the local Wallan and wider Melbourne market of their products and services, as well as offer a direct booking channel. In such an intensely competitive industry in Melbourne, the website had to be comprehensive in order to have any hope of ranking highly in search engines. Detailed and creatively written content, as well as proper website structure was fundamental. Also crucial, was the website's integration with other digital communication channels, namely major third party web portals and social media. No doubt, a sales network would first and foremost be built via social contacts, friends of friends and other local businesses. But having a presence on local portals and social media is simply not enough. Visitors must be attracted then re-directed to the website for conversion. Focus on this project was to deliver a functional and content-rich website. In doing so, ensuring high ranking in all major search terms and phrases for this jumping castle and party hire market in Melbourne. Web Conceptions provided an all-inclusive solution that incorporated design, functionalities, backend content management solution (CMS), content, Search Engine Optimisation (SEO) and digital communication via third party websites and social media. All this at no extra cost! Website Design: Specifically selected by the client for its colour and fun-looking impact, then adjusted to suit and work well for the user experience. Website Content: All content on this website was researched, managed and written by Web Conceptions, then verified by the client. This makes the entire project simple and easy for the client, and indeed delivered much faster. It also ensures proper search engine optimisation (SEO), as it is content that truly achieves results. Website SEO: In SEO, Content is King. Realistically, a website cannot achieve proper search engine optimisation without having professionally written web content. Web Conceptions have staff writers with extensive experience in market research, business and website development. An ideal combination to ensure effective SEO. At the same time, web content must be supported by proper website infrastructure, back-links and an integrated digital communications, among other strategies. Backend CMS: Every website needs to have some sort of dynamic element, thereby allowing the website owner to regularly update and manage components of website content. With this project, a CMS was built to manage content for special jumping castle promotions, news and testimonials. A fully customised and easy-to-use CMS. Digital Communications: Mainly in two key areas. Firstly, the website platform has the ability to update content and then share via all sorts of social media channels. In doing so, attracting a new audience, building brand exposure, and driving traffic back to the website source. Web Conceptions created all major social media profiles and trained the client on how best to utilise them. Secondly, third party websites and portals, important for building brand exposure, online presence and back-links for search engine optimisation. Web Conceptions created profiles on a number of major websites/portals and linked them all to the Jolly Jacks Jumping Castle website. Incredibly, Google began crawling this website within 24 hours! This is a major achievement by the world's largest search engine, being able to search and find a website so soon. However, it is also testament to Web Conception's ability to build good, clean and well structured websites, as well plan the SEO process well in advance in order to optimise efficiency. 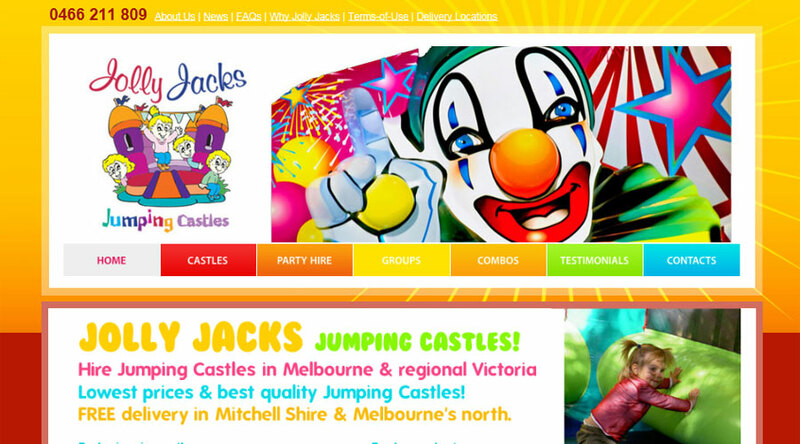 www.JollyJacks-JumpingCastles.com.au immediately ranked very highly in major, pre-determined search words and phrases, such as "Jumping Castles in Wallan" and "Book Jumping Castles in Wallan", as well as the same phrase with other targeted markets in Melbourne, i.e. Mitchell Shire and Melbourne's Northern Suburbs. Eventually, the website will rank well when searching "Jumping Castles in Melbourne" and "Book Jumping Castles in Melbourne". No doubt, this will drive business.